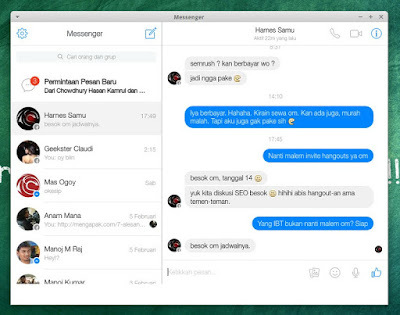 Facebook Messenger PC and Desktop - Facebook is one of the most popular social media networks. This statistic of the fourth quarter of 2015, Facebook had 1.59 billion monthly active users. Then in the third quarter of 2012, the number of active Facebook users had surpassed 1 billion. Wow! That's a fantastic amount we thought. We know, facebook serve a service named Facebook Ads for your online marketing. So for you who have an online business, Facebook can be your good choice to promote business online. There's some desktop app we can use. It's pidgin or Messenger for Desktop. However, I won't tell you using pidgin to accessing Facebook messenger. We will use the second choice. 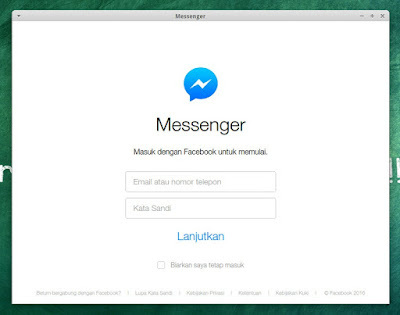 How to Install and Use Facebook Messenger on Ubuntu Linux? Once I told you about the short description and the features of this app, now I'll tell you how to install and use this app. It's really really easy! The things you must need is the app. Of course for your Linux. Facebook Chat Messenger for Linux PC has 2 versions. It's for x86 and x64 based operating system. So download which right for your system. Now open Messenger and login to your Facebook account and it's works! How to exit or change account? Click Gear icon (top left corner) the choose Exit. Enjoy! 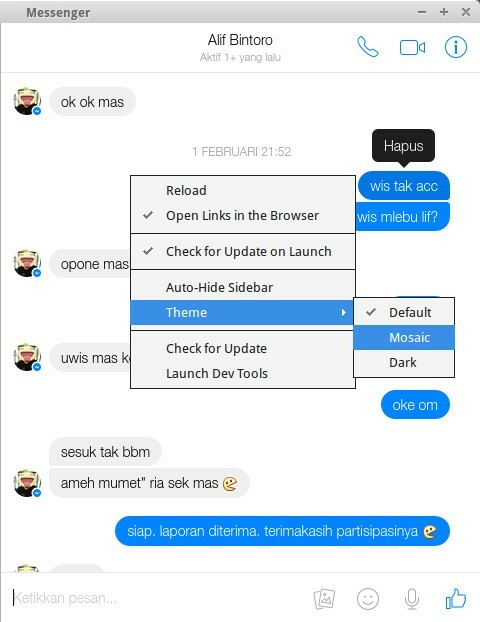 We can easily change Messenger for Desktop theme. The default theme is light, you can change to a mosaic and dark theme. How? It's very simple. You just need to find and select the themes by right-clicking anywhere. The picture above is the screenshot taken from my Ubuntu. Update! You can use Franz to open multiple social media account. Read our post Franz: Manage Multiple Business and Private Accounts in One Window. 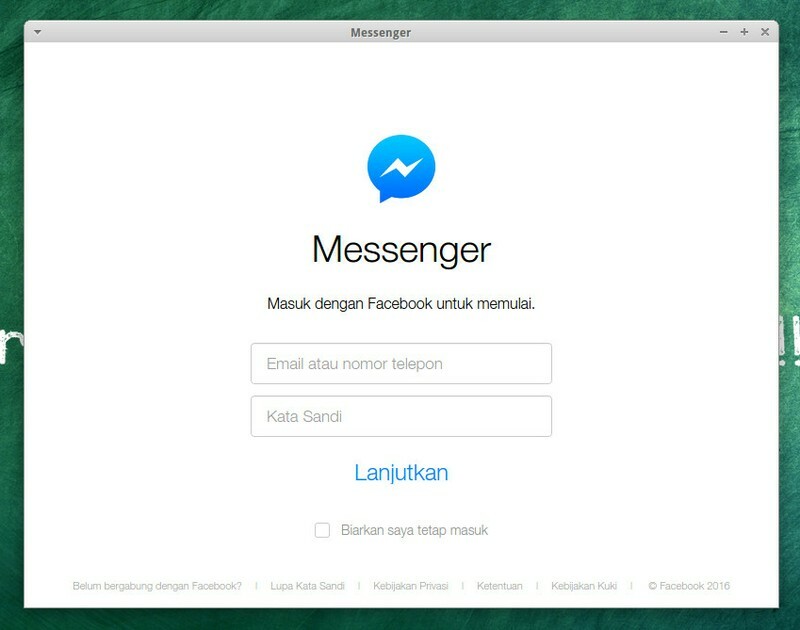 So that's all I can write about Facebook Messenger for PC (Linux, Windows, Mac OSX Operating System) and how to open messenger from your laptop . I hope this post be the answer for your question and can be your solution. Hope too you've enjoyed reading this tutorial as much I’ve enjoyed writing it. Thanks for visiting us.